WASHINGTON—Promising citizens that they would finally take action if the President crossed this new red line, GOP leaders announced Monday that they were moving their goalposts for opposing Trump to him being filmed masturbating on an American flag in Arlington National Cemetery. “After today’s attack on U.S. intelligence agencies, we have officially moved our line in the sand to President Trump being caught on video, vigorously pleasuring himself to completion amid the graves of fallen U.S. soldiers,” said Senate Majority Leader Mitch McConnell, who claimed that in order for Republican officials to begin blocking Trump’s nominations or voting against his policies, the video must be at least a half hour of the president with his pants around his ankles, humming the national anthem, and giving the middle finger to the Tomb Of The Unknown Soldier. “Unless we see clear footage of President Trump looking into the camera, his face twisting in pleasure as he climaxes, we will refrain from taking any concrete measures to reel him in. If Trump is masturbating on a flag anywhere other than Arlington, or if he does not ejaculate directly on Old Glory, we will continue to stand behind him. And if fewer than 100 eyewitnesses see him engaged in the masturbation, we will dismiss it as hearsay. 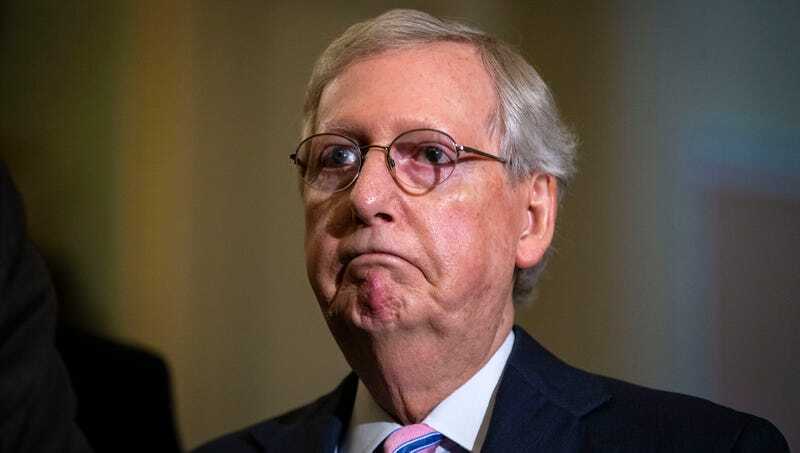 Of course, it goes without saying that if he claims it was a joke, all will be forgiven.” McConnell added that Republicans would stand firm on their new line for President Trump except in the extraordinary circumstance of another open seat on the Supreme Court.